Vyborg is a small city located in north-western of Russia, near the border with Finland. It is located on the coast of the Gulf of Finland, at a distance about 120 km from St. Petersburg and 300 km from Helsinki (Finland). Viborg is one of the oldest cities in Russia. It was founded in 1293 by the regent of the Swedish king Torkel Knutsson. The town lies on the border of two powerful countries, Russia and Sweden. This circumstance influenced its turbulent history. The city survived several wars. At different times city was owned by Sweden, Finland and Russia. Many Finland citizens were born in Vyborg and Vyborg's region. They until consider Vyborg as their own city, homeland. 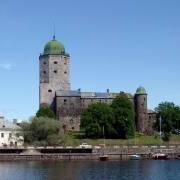 The most famous landmark in Vyborg is its medieval castle. Vyborg Castle is only fully preserved designed in the European tradition medieval castle in Russia. There is the Museum of Vyborg History in the castle now. The museum permanent exhibitions are covering various periods of the city and castle history. From the castle “St. Olaf's tower” is great view of the city. There are lots of fun activities in castle at summer weekends (unfortunately, in those days, the cost of entry into the territory of the castle multiplied). Old Town of Vyborg is a very interesting place for tourists. Around 600,000 tourists visit Vyborg each year. You can start sightseeing from the Vyborg Castle. Head you up to the “Tower of St. Olav”. You can easily see magnificent sights of Old Town from the castle's tower with a bird's-eye view. Monument to the founder of the city Torkel Knutsson is located south of Vyborg Castle, on the “Old town hall” square. After seeing castle and museum you can walk along embankment to Market Square where you can buy various goods and souvenirs. After shopping on the Market Square you can walk along Lenin Prospect towards Red Square. There is Red Square in Vyborg like in Moscow. You will see City Park along of Lenin Prospect and many small shops along opposite street side. There is city library in the park near the Red Square. Library's building author is famous Finnish architect Aalvar Aalto. “Batareinaya Gora” hill is at and of the street and there is department store too. There is a monument to Peter the Great on a hill to north of the Vyborg Castle. It is believed that on this place Peter the Great led the assault of the city. In the northern part of the square you will see a small arch. Passing through the arch, you get to the road leading through “Annensky” fortress to the “Mon Repos” park, which is popular with tourists and locals. This is one of the most beautiful places in Vyborg. Lots of interesting events for tourists are held in Vyborg every year are. It often hosts historical reconstructions, knightly tournaments, concerts. Artists of the Mariinsky theater of St. Petersburg are performing sometimes in the Vyborg Castle in summer. Branch of the museum “Hermitage” is also located in Vyborg. Vyborg is a great transportation hub. People and goods from all part of Russia, Europe, Asia and America travel throw Vyborg and Vyborg's custom. Railway and automobile road pass through Vyborg to Finland. There is seaport in Vyborg too. There are many shops, restaurants, cafes, travel agency and banks too. There are some towns and big settlement in Vyborg region: Primorsk, Kamenogorsk, Svetogorsk, Roschino, Krasnoselskoye. Trip from Saint Petersburg to Vyborg takes approximately two hours. You can drive to Vyborg by car. It is better to park car near Vyborg Castle or the Old Town and stroll through the streets of the old town. By car is also convenient to get to the famous “Mon Repos” park. Vyborg is easily accessible from St. Petersburg. You can use as a transport car, bus or train. It is very convenient to get to Vyborg by bus from Saint Petersburg. The bus station is located next to the shore of the bay and the railway station. Vyborg Castle and the Old Town can be reached from station on foot for few minutes. You will see the castle, leaving the bus. Buses leave to Vyborg from the bus station located near metro stations “Parnas” in Saint Petersburg. You can get to Vyborg also by train from the “Finland Station” of Saint Petersburg. It is possible to get to Vyborg from Helsinki by train or by bus. There are boat tours from Lappeenranta city (Finland) in summer. Photos of the most beautiful places in Vyborg. Tourist map of the Vyborg city (attractions, shopping, museums, hotels). Hotels in Vyborg (description, location, reservations). Lappeenranta is the closest city in Finland. St. Petersburg: useful information for tourists. Forums: Here you can ask questions, leave comments and share experiences.